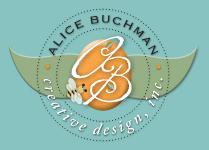 Alice Buchman Creative Design, Inc.
Award winning graphic design studio offering multiple services to meet today's digital and print time-sensitive demands. Experience and know-how constructs the solid foundation that is the basis to all creative design. While filling the spaces with lively expression and continuous flow add spark and energy to lift the message off the ground, the final touches and a splash of color build character and personality that reflect each individual business brand and bring your story to life. With over 28 years of experience in the industry and a handful of national and multi-state awards (including the USPS Irresistible Mail Award), ABCDesign uses proven methods for measurable results to elevate growth in your business. We would like the opportunity to transform your brand, so together we can build lasting relationships with your customers and prospects. Logos and Branding - Whether you are a start-up business looking for your identity or an established company wanting a refresh or renew, this would be the foundation of all your marketing strategies and what it conveys. We develop eye-catching logos with cohesive branding that reflect the company's personality and values to stand the test of time. Websites - Your website is your number 1 sales tool. We can build your professional, responsive site where you want it, from Wordpress or Wix to completely customized. We strive to create a user-friendly experience so your online visitors stay longer with easy-to-find clear and effective content leading them to take the next step - an order, donation, request a quote and more. Print Media - From business cards and brochures to catalogs and complicated die cut mailers, we utilize over 30 years of print experience to guide you through the concept to design to print process with ease. Did we mention the multiple national and multi-state awards for print projects we created from concept to print? Ads - Whether print ads in publications or online banner ads, our focus is on a clear and concise message that catches the readers attention in a blink of an eye. Email Marketing - A cost-effective solution that gives you the power to reach customers in a place most people visit every day — their inbox. We take the tried and true best practices along with industry trends and techniques to maximize success with results you can easily track. Join an award winning team recognized by the industry leader in email marketing - Constant Contact. Social Media Marketing - Engage with your target audience as you build relationships and your brand awareness with the right content at the right time. Presentations - Whether it is a full presentation or one customized slide, keeping your audience's attention is our top of mind. Signage, Large Format and Banners - We communicate a clear message to a targeted group to draw attention to its purpose, while reinforcing your company's brand and values. Trade Show Exhibits - We design high visual impact displays to draw visitors into your exhibit that tells your story and increases your sales leads. Photography - Visual marketing helps sell your products and services from online to print. Using the old adage "a picture is worth a thousands words," we convey your message by matching imagery with content to enhance your customer's experience. From product imagery to on-site photography services, we can capture your company's essence. Video Production - Nothing tells your story better then video. We record and compile video content along with adding graphics, narration, music and more to complete an entertaining and informative video to broadcast on your social networks and website. Illustrations - When a vector graphic is needed, we recreate a product image or raster logo into vector art for better high-end reproduction. Ready to build your brand and grow your business? Give us a call at 610-698-6156 or email Alice at ab@abcdesigns4u.com to see how we can help.